Benjamin Netanyahu, two-state solution: Palestinian state will not happen under his reign, Israeli PM says. Netanyahu speaks at an East Jerusalem settlement Monday. Netanyahu’s remarks in an interview with the NRG website - which is owned by casino mogul Sheldon Adelson and tied with the settler newspaper Makor Rishon - were a last-minute attempt to pull right-wing voters away from Habayit Hayehudi. Mr. Netanyahu said he had authorized that construction during his first term to block Palestinians from expanding Bethlehem, and to prevent a “Hamastan” from sprouting in the hills nearby. 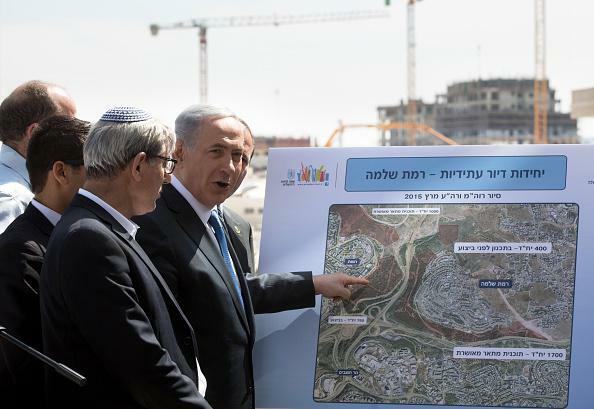 Mr. Netanyahu stood next to maps of Har Homa, one from 1997 that showed its empty hillsides, and one showing its roughly 4,000 apartments today. A further 2,000 are under construction or planned. “It was a way of stopping Bethlehem from moving toward Jerusalem,” Mr. Netanyahu said of his approval of Har Homa, against the United States’s wishes, in 1997. The prime minister, the Times says, also played up the settlement as a means to ease the price of housing in Israel; cost-of-living and economic issues have been prominent in chief opponent Isaac Herzog’s campaign against him.